Wheels: Made by MORAD, anodized brilliant blue, it has been machined for weight reduction. Crown: Produced by ZF/OXIA with an FIM protector. Footrest: Made by S3, charcoal grey anodized aluminum, fully machined; very high quality with an excellent finish. Rear wheel adjusting snails: Also manufactured by S3, charcoal grey anodized aluminum, featuring a convenient and compact design. Circuit breaker: OXIA, approved by the FIM. Cylinder head: Produced by S3, the weight has been reduced and it is finished in black. Housings: The housings have received a special stabilization treatment. Exhaust: New diameter elbow for better performance at low revs. CDI: New Dual spark CDI HIDRIA. Rims: The rims are anodized a brilliant blue, the hubs and two spokes are flourescent yellow (for easier valve location). Black finish: Triple trees, fork and cylinder head. Charcoal grey finish: Footrests, rear wheel adjusting snails, master cylinder covers and chain tensioner. 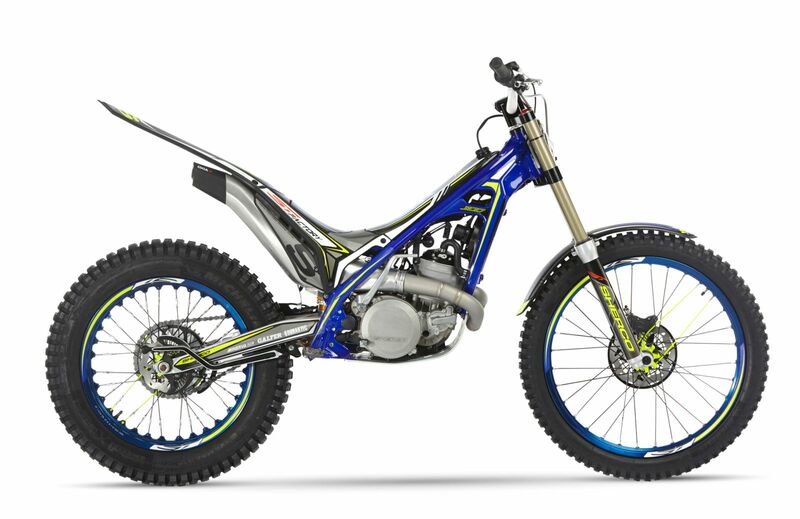 Graphics kit: Brand new and exclusive for the new 2016 Factory Special Edition Trials Model. The neon yellow is sublime and energizes the lines of the bike. Handlebar: OXIA Handlebar has a satin white finish. New bright blue and yellow handlebar pad. The 2016 Factory Special Edition Trials Model is the best model to date, and is the fruit of over 15 years of experience and knowledge in the production of Trials motorcycles. The model will be available in this configuration in 125cc, 250cc and 300cc for a limited time.